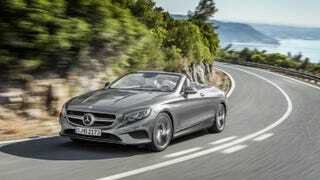 Mercedes plans to raise the roof at the Frankfurt Motor show this year with the drop-top, super-hot S-Class Cabriolet. The german luxury automaker impressed everybody last year with their all-new S-Class limousine, and then they really got our frankfurters roasting when they revealed the S-Class coupe. Now they even managed to get the looker to take its top off for you. This will be the first Mercedes-Benz drop-top four seater S-Class in the lineup since way back in 1971 - just don’t expect it to be as roomy back there as the car’s four-door cousin. The roof will raise or drop in just about 20 seconds at speeds up to 38 mph, and rolls into the trunk where an automatic divider activates to keep everything organized back there. Beyond an extra set of seats and a disappearing act for a roof, you get a load of fancy features like neckwarmers for those chilly mornings, automatic climate control that will automatically adjust between top-down and top-up, and an array of 12 sensors that measure everything from solar radiation levels to the dew point to keep you cozy and safe, like an imaginary blanket. Technically speaking, the base model car has a biturbo 4.6-liter V8 engine to waft the car around with 449 hp and 516 lb-ft, and features Mercedes’ new 9G-TRONIC 9-speed automatic transmission, which features eight speeds plus one more if the name wasn’t clear enough. There will be an AMG-63 option having the wind forcefully caress your face featuring the seven-speed AMG Speedshift transmission and 5.5-liter V8 biturbo power-planting 577 hp and 664 lb-ft, hitting 60 mph in 3.9 seconds. Both the S550 and AMG-63 will hit the floor in Frankfurt on the 17th this month.